(A) Printer Auto-Adjust Settings - Whichever printer you are using, if there is a setting in the printer driver that states something like "auto adjust images" then you should NOT have that option selected. The problem with "Auto-Adjust" is that your printer software will adjust the lightness of each tile image separately. This can cause a lightness or color mismatch between adjacent tiles. (B) Printer Layout Settings - Some printer drivers have settings that will crop part of images off (i.e. "crop to fit" options). You should not avoid these settings. (C) Avoid Windows Print Wizard "Photo" Setting - If you are printing with the Windows Print Wizard, then you should choose the "Fax" layout option instead of the "Photo" layout option. The "Photo" option crops (cuts off parts of) your images. (A) Digital Image - Your digital image can be from any source. The file format should be Jpeg, Tiff (uncompressed), or BMP. The higher the resolution, the better. It is better to use images with a minimum resolution of 2 or 3 megapixels, but any image can be used. It is best to avoid very low resolution email or internet thumbnail images. (B) Printer - You can use any printer to print your photos with. This includes inkjet, laser, thermal, and you can even print your poster at your local photo lab (as a series of 4x6" tile photos). If you are using a borderless printer then it probably is a good idea to create an "Edge Calibration" profile in Poster Buddy for your printer. The "Print Size Per Tile" section of Poster Buddy shows your currently selected paper size. It also indicates how large the margins on your prints will be. The "Trimmed" size is the size of each poster tile print after the margins have been trimmed off. The paper size and/or margin size can be changed by clicking the "Edit" button. 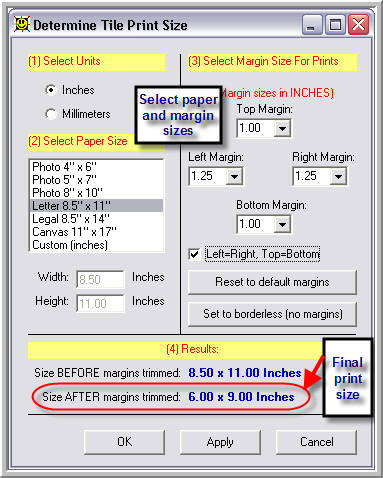 Note - After you select the paper and margins that you are using, you can see the "final print size AFTER margins trimmed" and confirm that it is what you expect. When you are finished entering the paper/margin information, then click the OK button. Many printers cut off part of the edges of images. This is especially true for printers that do borderless printing. This can be a real problem when making posters. Fortunately, Poster Buddy has a solution for this. The Edge Calibration feature of Poster Buddy allows you to measure and compensate for the amount of edge clipping that your printer does. To compensate for this edge clipping, you need to check on the "Adjust edges" checkbox and select the Edge Calibration profile for your printer from the adjacent dropdown box. If you haven't made an Edge Calibration profile for your printer, then you can click on the small "Edit" button (or select the Tools->Edge Calibration menu option) to open the Edge Calibration Dialog. 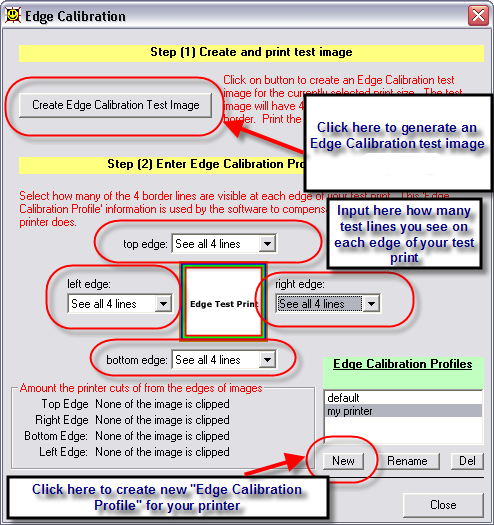 (iii) Generate an Edge Calibration test image for your paper size by clicking on the "Create Edge Calibration Test Image" button. Save the image onto your hard drive. (vi) Count how many lines are visible on each edge of the Edge Calibration Test print. Enter this information in the Edge Calibration dialog for your new Edge Calibration Profile selected. (vii) Click on the "Close" button when done. Your new Edge Calibration Profile has been completed. (C) When to use Edge Calibration - The "Adjust edges" or "Edge Calibration" feature is primarily used when doing borderless printing. If your printer is clipping off parts of the edges of images and you are NOT doing borderless printing, then the chances are that there is a problem with your printer software settings. In that case, look at your printer software settings and make sure that no option for "crop to fit" or anything that might crop off part of your images is selected. Need To Use Edge Calibration? Poster Buddy lets you select what part of your source image to include in your poster. You can zoom into your source image and/or pan left/right or up/down. When you are ready to create your poster, simply click on the Save Poster Tile button. That will open the Poster Save dialog. 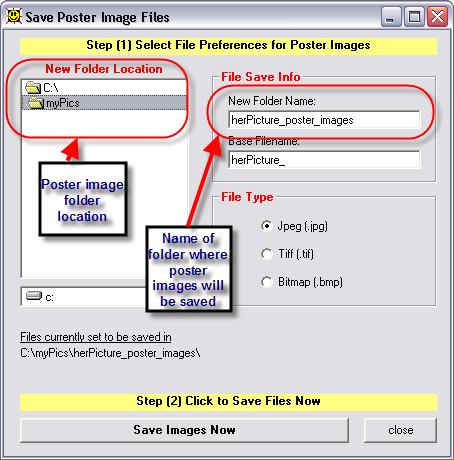 The save poster dialog allows you to select where you want your poster images to be saved, as well as what the folder name, filenames and format for the poster images will be. 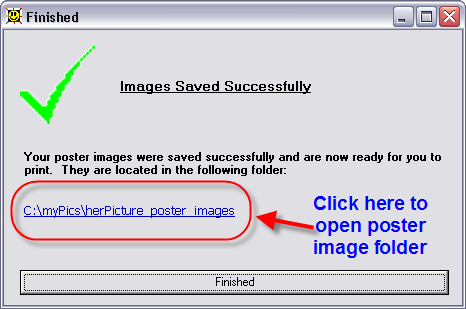 By default, the poster images will be saved in the same folder as the poster source image. Click on the "Save Images Now" button to proceed with saving your poster images. The next step is to print the poster tile images that were just created by Poster Buddy. The poster images can be printed using just about any imaging application. You can also print the poster images using the Windows print wizard. One good (and free) application that can be used to print your images is Irfanview. (i) Avoid any settings that will automatically adjust the lightness or color of the poster images. This could result in a mismatch between adjacent poster tiles that could look bad. (ii) Avoid any setting that will crop your image. When printing with the Microsoft Print Wizard, you should select the "Full page fax print" option instead of the "Full page photo print" option. This might sound counterintuitive, but it is absolutely necessary for poster printing (because it avoids image cropping). Choosing the Fax option doesn't affect image quality, it only affects the layout of the image on the page. (iii) If using Irfanview, then select the option to print the image based on the internal image resolution. 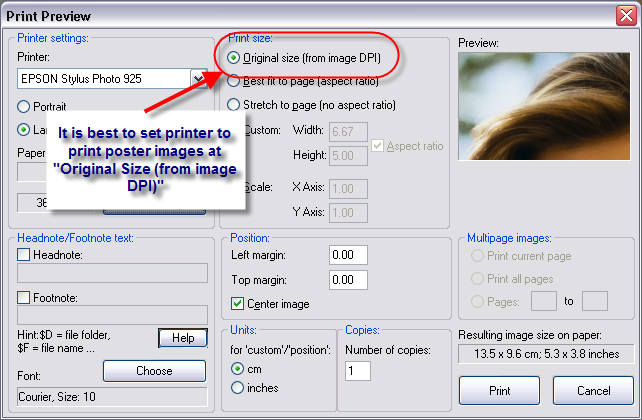 This will ensure that the image isn't cropped and that it prints at the correct size. Once the poster is printed (and any margins trimmed off) then you can assemble the poster tiles together. Optionally, you can also mount the poster in a frame or on a foam board. If your poster tile prints are not borderless, then you probably want to trim the borders off. You can either do this manually with a pair of scissors, or for a cleaner and straighter cut you can use a paper cutter. Try to cut as straight as possible, and be sure not to cut off any part of the actual image. The next step is to place the poster tiles, edge to edge, on a flat surface to see how the poster looks. The next step is to connect the tiles together. The best way to do this is to tape the backs of the tile prints together. Clear scotch tape should work fine for this. When you flip the tiles over to tape them, you need to be sure that the orientation is correct. You should flip them as if you were flipping the entire poster. It is a good idea to flip one row at a time, and flip them so that the far left image now become the far right image, etc. Check the tile prints before you start taping them together to make sure they are in the right order. The first time you do this, it can seem a bit confusing, but after that it should be easy. For an especially nice finishing touch, you can mount your poster onto either poster board or into a picture frame. You can purchase poster frames anywhere, and poster board can be found at arts and crafts or office supply stores. Both can be very inexpensive.